BANGKOK, May 18, 2010 (AFP) - Thailand's revered king is facing calls from anti-government protesters to intervene to end the nation's crisis, but the 82-year-old monarch has remained largely silent since the unrest began. "His Majesty is our only hope," a senior leader of the "Red Shirts" movement, Jatuporn Prompan, said at the weekend in pleas that were repeated as troops battled protesters in five days of clashes that have left 38 dead. 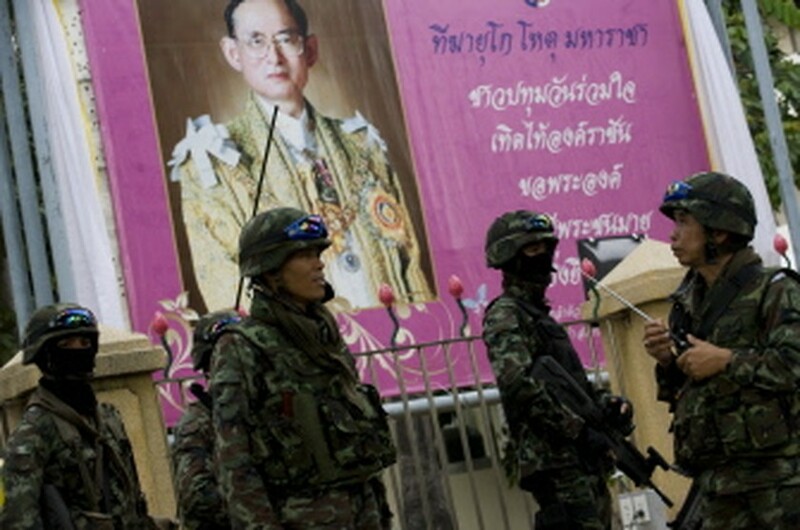 It was the second time that the Reds have publicly appealed for King Bhumibol Adulyadej to step in to solve the two-month standoff, as he has done in the past during six turbulent decades on the throne. During a 1992 uprising the king summoned military and protest leaders who, according to protocol, crawled towards him on their knees in dramatic televised scenes which effectively brought the violence to an end. The king, seen by some Thais as a demigod, continues to command immense affection and respect among his subjects. But during this bout of unrest, which has its origins in the 2006 coup that ousted premier Thaksin Shinawatra, the monarch has been confined to a hospital where he was admitted last September for treatment of a respiratory condition. The palace makes no statement on his health, and the sensitivity of the issue means it is not discussed in the Thai media. But in his few public appearances, it is clear the king is physically very weak. He appeared on television in February next to Bangkok's Chao Praya river -- sitting in a wheelchair and holding his dog on a leash, and left hospital briefly on May 5 for the 60th anniversary of his coronation. The only monarch that the vast majority of Thais have ever known delivered a brief speech in late April. In a quiet voice, he urged newly appointed judges to fulfil their duty. But the deaths and the fighting were not mentioned. "The king says nothing about the realities of Thailand today," says Arnaud Leveau from the Institute of Research on Contemporary Southeast Asia. "These last comments did not refer to the situation and gave no indication of what he knows, or what he thinks about it," he said. The Red Shirts, mostly urban and rural poor who were won over by Thaksin's populist policies, condemn the current administration which came to power with the army's backing in 2008. They say the government is the puppet of the nation's elites in the palace, bureaucracy and military circles, and are clamouring for their share of Thailand's economic and political pie. Many Thais, including the Reds, are now hoping for the type of decisive royal intervention of two decades ago which is still well remembered in the kingdom. "I want the king to stop this now," said a 53-year-old woman, cooking food for demonstrators in the Red Shirts' camp, who gave her name as Sumboun. "I want to stop and go back home. But why won't the army stop?" The crisis, which flared in mid-March and has left 67 people dead and about 1,700 wounded including 25 slain in a failed army crackdown on April 10, is the country's worst civil unrest since 1992. The Reds' calls for the king to intervene seem to be aimed at reaching a compromise solution, said Paul Chambers, a Thailand expert at the University of Heidelberg in Germany. "As it stands now, if the government and the military are able to continue their crackdown on the Red Shirts, then they would have organised all this for nothing." "If they find somebody higher, more powerful than the government to compel the government to stop what they're doing now, it would be a sort of victory," he said, adding that it could also hand them a sought-after amnesty. But observers are doubtful that wish will be fulfilled. During major royal ceremonies, the king has mostly been represented by his wife, Queen Sirikit, his heir Crown Prince Maha Vajiralongkorn, or his admired daughter, Princess Sirindhorn. "In April, I thought there might be a message, a speech to the people. But what we see in the pictures is the Queen, Prince or Princess. The King is above all, far from everything," said Chambers.